Our home is very casual and comfortable. As much time as I spend here, I want it to be a space that is both welcoming and a true reflection of our family. Rather than hiding away the plethora of photos we treasure, my husband and I decided to scratch the less is more approach. We display them, and other things we love, to enjoy on a regular basis. Our home features quite a few gallery collections and, now, I can't imagine it any other way. This one, hanging in our breakfast nook, showcases a mix of framed photos blended with a few textural items, several unique vintage and antique pieces, plus a special "found" object. This grouping started with the lovely vintage framed print in the center (a scene of cottages surrounded by trees and fields), which was the "jumping off point" for the rest and ties all the colors together. The story of it's purchase is dear to me and I'm glad to give it a home within mine. In keeping with our home's neutral palette, I next selected an assortment of mis-matched frames all within the same color story and natural, matte finish. (Soon they'll see a new Spring rotation of images, as I update photos seasonally.) Then, I added a few round objects to soften up the hard, straight lines of the frames. 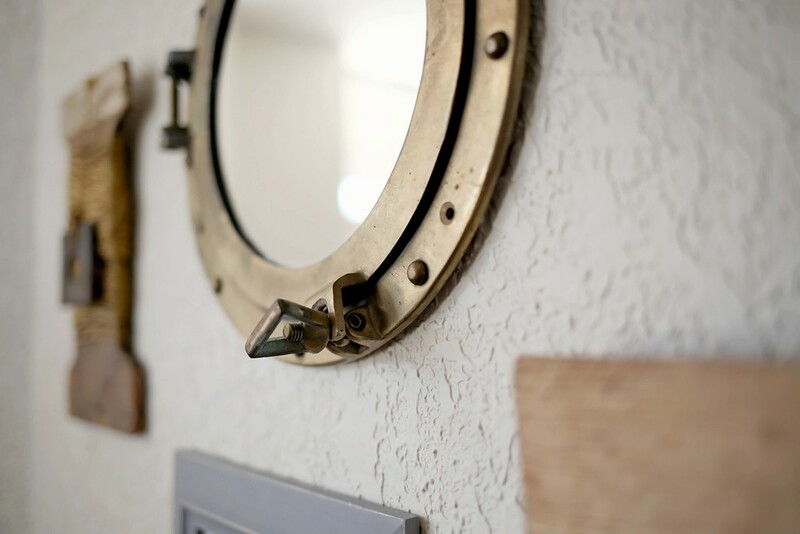 The mirror is a vintage brass porthole and I love the touch of green texture the boxwood wreath brings. I'm a sucker for decorating with antlers and I don't know that I'll ever give it up. I like that these give this group dimension and airiness. I found the text, wood grain and charm of the antique cotton carder (bottom center) to be interesting. I also like that the stamping compliments the typography in the date print. The "important dates" I simply created myself and printed on linen paper, contributing a personal and sentimental touch. Lastly, I hung the string (vintage trout line? ), which my mom literally found in an abandoned barn near Grand Lake and thought I might appreciate. Oddly enough, I do. That, and the fact that my Mary Poppins of a mother is a fantastic picker and magically shows up with just the thing I never knew I needed. I don't follow any "rules" when it comes to gallery walls. I just find an inspiration piece and add from there. My best advice is to choose what you love and just go for it. With gallery collections, I really believe the first step (in terms of both selecting items and actually hanging it all) is the hardest. It's your home, after all. Make it yours.